The Genesee Store has deep roots in California Gold Country history. In 1862, Edwin D. Hosselkus of Genesee, New York came to this small valley and christened it Genesee, CA. His dreams pulled him West, but fortunately his savvy business sense lead him beyond the prospects of mining. Soon after arriving, he turned his interests to ranching and forming a mercantile business. Out of the surrounding forest, he felled and milled trees to build a general store/post office, granary, creamery and blacksmith shop. 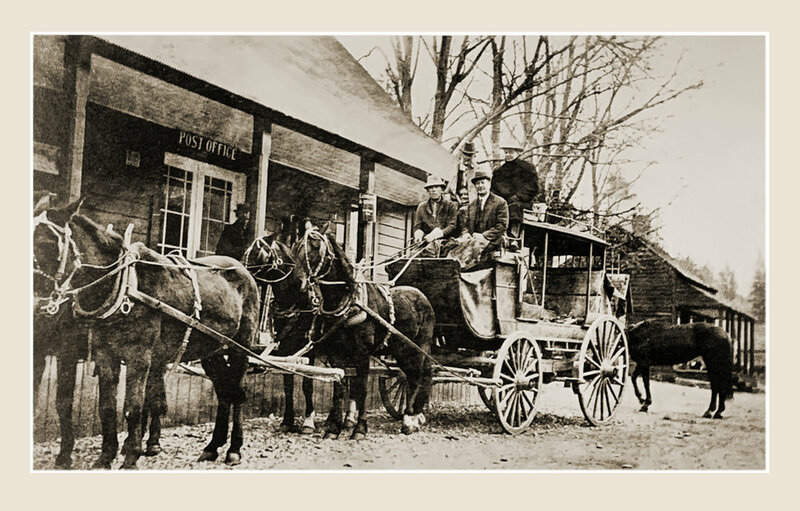 The Genesee Store was a common stagecoach stop for the area. Everything from supplies to mail would come through this central building. Meet Gee Pond Joe, the original chef for the Genesee Store and Hosselkus Home. Gee lived in a loft above one of the buildings across from the store. 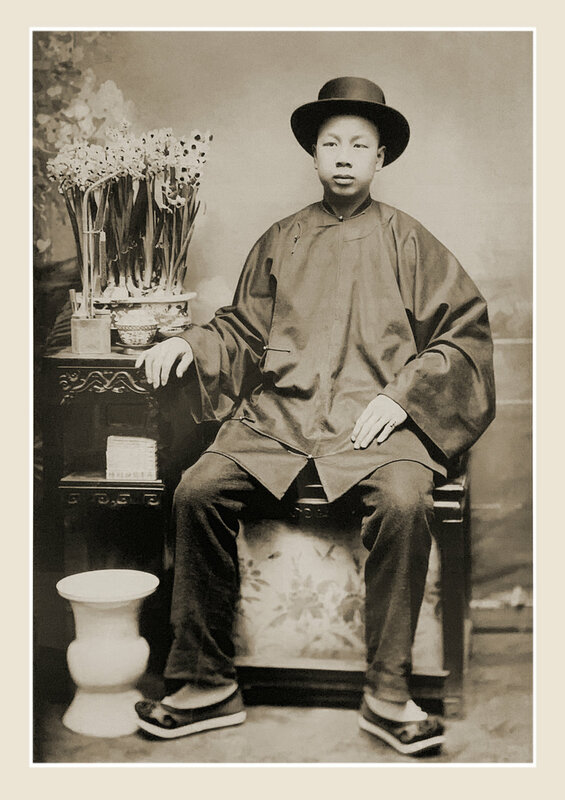 He would write letters to his mother back in China telling of the hard work and unique cuisine. He was famous for his ranch beans. Standing directly across the street from the Genesee Store. Edwin Hosselkus constructed his home. Seen here is the Hosselkus family. The unique structure was quite special for the area and today is considered a historical landmark for Plumas County. The home has been restored and stands proudly as a view from the patio of the Genesee Store. The Genesee Home and most of its surrounding buildings where built with lumber from felled trees around the property. Seen here are the two content looking Hosselkus brothers taking a rest out in the forest amongst their equipment. Prior to the Hosselkus’ arrival, the land was known as hospital ground to the Northern Maidu Indian. This peaceful tribe established small villages along the riverbeds and valleys throughout Plumas County. They were renowned for living harmoniously with their environment. At the confluence of Grizzly Creek and Indian Creek was one such village called Yetámato-non. The Maidu presence in Genesee Valley serves as a constant inspiration for us to tend to this land with the same care and intuition as the Northern Maidu did before us. In 1963, while Maidu Basket Weavers Daisy Baker and her daughter Lilly Baker made baskets at Daisy’s home in Indian Valley near Greenville, California, American conservation photographer Philip Hyde documented the ladies work with a series of medium format 2 1/4 film photographs. Daisy Baker died just a few months after the photo session, though Lilly Baker lived until age 95 in 2006. Both Daisy and Lilly made Maidu baskets for many years and taught others the skill, but none have produced the number or variety of shapes and sizes that the Bakers did. Some historians have called them, “the last of the Maidu Basket Weavers.” Besides her childhood home in Big Meadows, now mainly submerged by Lake Almanor, two of Lilly’s favorite places to cut and gather willows for baskets were along Indian Creek in Mormon Canyon between Taylorsville and Genesee and at the Mouth of Genesee Valley. Sets of the Maidu Basket Weavers 10 photograph series of original sliver gelatin prints can be found in permanent collections at the Oakland Museum, The Maidu Museum Interpretive Center and Historic Site, The Redding Museum, Plumas County Museum, Greenville Cy Hall Memorial Museum and Indian Valley Museum.